Van Susteren's Fox News blog, GretaWire, showcases Trump's tweet about his excitement at hosting a Mitt Romney fundraiser today. But there's nothing about his birtherism binge of today, that occurred both on Twitter and on television. Although she's always friendly and deferential to Trump, I've always gotten the feeling Van Susteren is not especially a fan. But that doesn't mean she gives him any serious challenge on his birtherism. So I'm not optimistic tonight will any different. But I'll be watching and posting. 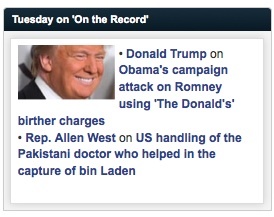 UPDATE: Another reason not to expect Van Susteren to offer much of a challenge to Trump's birtherism: Fox News' description of the upcoming segment paints Mitt Romney and Trump as victims of an Obama-campaign attack ad. President Obama has attacked Trump and Romney by being born in the United States??? This whole Faux kerfluffle is a great barometer of just how little the Repubs have against the President. And they have less each day, as they continue to ooze lower and lower below the line of respectability . Trump will, however, be completely and totally disgraced and done as a celebrity of any sort if Obama is victorious. This is a dangerous game he is playing. Judging from the nauseating discussion about “plain talking” Trump on The Five, Greta will do exactly as we predict. Iâm in favor of having âThe Donaldâ on as often as possible. Heâs as likeable as when your alarm is going off on Monday morning, and as huggable as a cactus. His act and thatâs what it is, is nothing but wanting to draw attention to feed his ego, and of course Greta and Fox are happy to oblige as long as he continues with his Obama hating and bashing to feed the simple minded his slop. Not only has The Combover not disavowed his idiotic birther smear, he has doubled-down by regurgitating it today. But don’t expect Greta Van Suckup to challenge The Combover. She will toss him a few softball questions and sit passively with her botox-frozen face as The Combover prattles on. Only OxyRush Limpballs and Snow Snooki get this total deference on Fux Noise. My bet is she'll play up the "there's no reason to blame Romney for Trump's birtherism" angle. She will give him an easy out. She always does.